9/28/18 RADIO BEOGRAD FEATURE: Od Zlata Jabuka, Marija Vitas’ wonderful radio program, with a full feature on Eva’s two most recent albums, LEMA LEMA & SUDBINA. Sophie Pinkham writes for Music & Literature(5/16/18): "The album is also a kind of humanitarian intervention into the Western Balkan music scene...Part of Salina’s project is to reclaim Balkan music from the bros, to recover its interiority and its poignancy, and, above all, to recollect the many women musicians who have helped to create and preserve it...Salina told me that she has recently been thinking a lot about women refugees and migrants, and about “hidden singers,” the countless women whose songs are housebound because of social strictures. When these women are scattered by war and disaster, songs are one of their most potent and most portable reminders of lost homes, of societies that may never be reconstructed. “Sudbina” is a reminder that songs can survive once a singer and the country of her birth are gone, crossing an ocean, shaping a new woman’s mouth into the sounds of wonderful, once-unfamiliar languages and lives." RootsWorld, 5/15/18: "...music that delivers emotion in abundance despite, or perhaps because of, the fact that only vocal and accordion power it..a perfect symbiosis, with Salina’s voice moving easily from playful to poignant and Stan’s full mastery of the squeezebox enabling him to enhance every note and nuance while snaking his way through subtle variations on the melodies...a glorious half hour that you can revisit any time you like and be better off for it." Fantastic review from PopMatters (3/29/18): "...darkly glorious, an exploration of what it means to honor the past without glossing over the melancholy truths of it...Stripped-down arrangements of each song allow for a far more effective demonstration of strength than anything lusher likely would, and such impact is fitting...(Vida) Pavlović once wondered what would become of her music when she was no longer there to sing it. Thirteen years after her death, Eva Salina echoes the concern back across a temporal canyon and, simultaneously, sends it forth into the future." Green Man Review (4/19/18): "All fans of Balkan music will enjoy this album. These two musicians have amazing chemistry between them, and bring great passion and joy to the music." 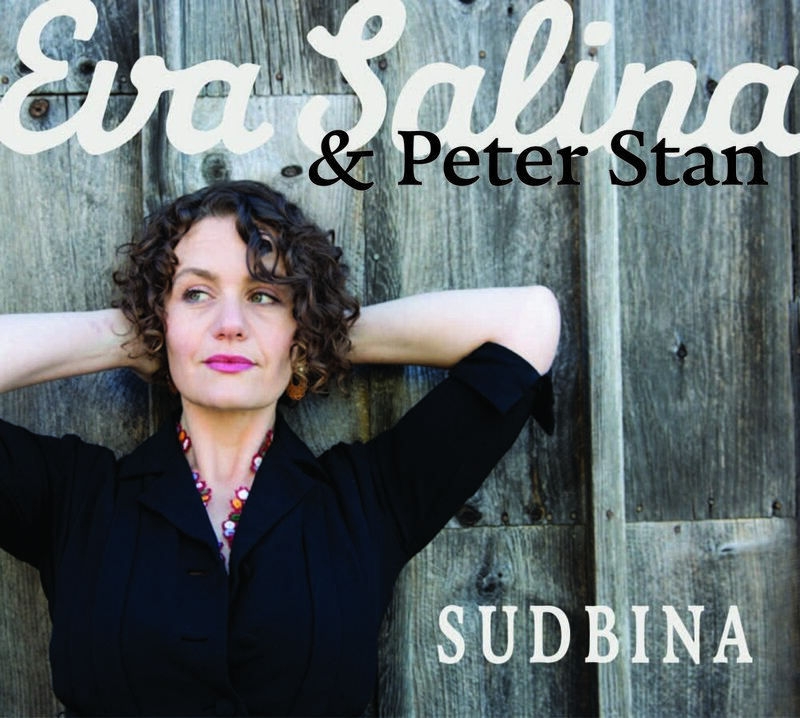 World Music Central (4/12/18): "Sudbina is a set of deeply-moving love songs showcasing the talent of Eva Salina as passionate performer of Roma music and Peter Stan’s masterful accordion work profoundly rooted in Balkan Gypsy music." New York Music Daily (3/26/18): "...a radical shift...spare, rivetingly intimate reinvention..."
SUDBINA: A portrait of Vida Pavlović, out on Vogiton Records March 30,2018, and available at select live performances before then, as well as via pre-order. California-grown, Brooklyn-based Eva Salina is a groundbreaking interpreter of Balkan Romani songs. Raised in the US Balkan Diaspora, Eva's mentors are some of the greatest living Balkan musicians. Eva’s rich, supple voice moves effortlessly through the intricate and demanding expression of Romani songs, intertwining vintage pop songs with her singular interpretations. A passionate activist for dialogue and mutual understanding, and an advocate for women in traditional and traditionally-based music, Eva is committed to a life of collaboration and evolving musical traditions. Eva's duo partner is Peter “Perica” Stan is a Serbian/Romanian Roma accordionist known for his playful innovation and soulful, intuitive improvisations. Eva & Peter draw on a long musical friendship, creating dynamic, intimate performances where mournful contemplation nestles gently amongst songs of riotous joy. Their new album, a portrait of one of Romani music’s most poignant women’s voices, comes out late 2017 on Vogiton Records. In their collaboration, Eva Salina & Peter Stan pick up and continue an interrupted legacy of empowered female voices in Balkan Romani (gypsy) music. Amplifying voices of past generations of Romani women musicians, Eva & Peter employ tenderness, grace, passion and a commitment to keeping these songs alive and evolving, while inspiring and teaching young people in the Balkans and the Balkan diaspora to participate in their own living traditions. Eva & Peter performed at Belgrade's Mikser Festival 2016 with Šaban's band, Crne Mambe, in a Šaban tribute curated by Dragi Šestić (Mostar Sevdah Reunion). Select performances include Festival Acordeões do Mundo (Torres Vedras, Portugal), California WorldFest, Brooklyn Folk Festival, Lincoln Center’s Meet the Artist, Carnegie Hall’s Musical Explorers, Global Copenhagen, Newport Folk Festival, World Music Festival Chicago, Re:Orient Roma Festival (Stockholm) and globalFEST.